The state of California is the dream destination for many people, especially the avid outdoorsman. This area contains endless opportunities for adventures in the great outdoors. With activities like hiking up one of the many towering peaks found in Yosemite National Park or cooling off by taking a dip in one of the many lakes and streams, this area is bursting with amazing things to do. If you love winter sports, you’ll find that California has numerous places to enjoy those as well. One of the best places in California to get out on the snow during the winter season is the Dodge Ridge Ski Area. Found in Pinecrest, CA, this is one of the best places in the state to learn a new winter activity or sharpen your skills through lots of practice. They open for winter on Labor Day weekend, so start planning your getaway to this incredible attraction today! The Dodge Ridge Ski Area offers plenty of spots to grab a bite to eat so you can keep yourself nourished and fueled throughout your exciting day of winter activities! Every day of the week, you can grab a delicious meal at the Creekside Cafe, Locals Cafe, Boulder Bar, or the North Fork Bistro. Each of these places offers tasty and satisfying meals to refresh you so you can get back out on the slopes! After your eventful day is complete, a glass of wine or a cold beer is the perfect way to relax. 862 acres of snowy terrain are waiting for you at the Dodge Ridge Ski Resort! You will love skiing here; there are 67 runs available for you to try. If you’re a beginner, there are lessons offered for all ages and skill levels. The typical season for skiing here is December through April and they have an average snowfall of 300-500 inches to provide the ideal setting for a magical winter day of skiing! The Dodge Ridge Ski Area hosts numerous events throughout the year to entertain their many visitors. Held all year long, these events include BBQ dinners, seasonal celebrations, competitions, and much more. Stay up-to-date with their calendar so you don’t miss out on all the fun! Come Stay with Us at the Hotel Charlotte! Find the best place to unwind after a thrilling day of winter sports at the Dodge Ridge Ski Area! 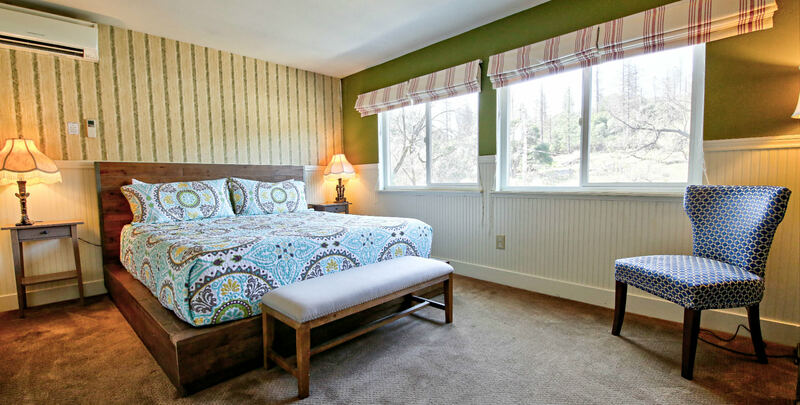 Hotel Charlotte is a historic bed and breakfast in Groveland, California, that offers comfortable furnishings and excellent amenities within a charming, rustic environment. Choose from staying in one of our twelve lovely rooms or renting one of our cozy vacation cottages. You can explore the many attractions of our surrounding town of Groveland, adventure through the magnificent Yosemite National Park, or simply spend time in our relaxing environment; we have an elegant living room, friendly and helpful staff, and even our very own restaurant to accommodate all of your needs! Don’t wait another minute to start planning your dream vacation; check our availability and book your stay today!